Zimbabwe and Botswana signed a billion Pula credit facility on Thursday, double what had initially been discussed, the leaders of the two countries announced. The two countries had previously held discussions on a 500 million Pula facility. Ahead of the final ceremony, comments by James Manzou, Permanent Secretary for Foreign Affairs and International Trade, that a “loan” would be agreed caused confusion. This was not helped by subsequent headlines in various media that there was a “bail out” package from Botswana to Zimbabwe being discussed. The reports drew fire on both sides of the border. In Zimbabwe, this was taken as yet another “mega deal” pie in the sky. 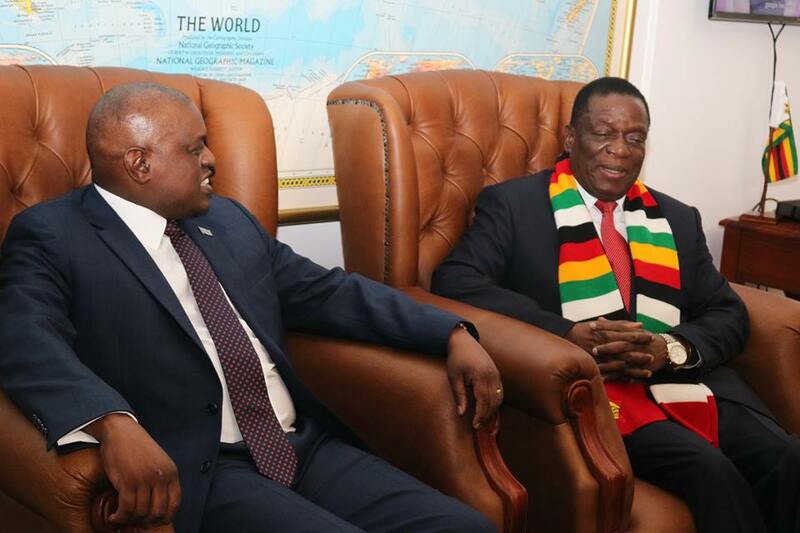 In Botswana, there was criticism that Masisi was spending tax money to bail out Zimbabwe in a year that Botswana’s economic growth is expected to slow. Ahead of elections in that country this year, this was a tricky time for Masisi, and his government quickly issued a clarification. Put simply, there is no large sum of cash exchanging hands. It was never on the table in the final bi-national commission talks. What is on the table is money from private funders for Botswana businesses willing to invest in Zimbabwe. Zimbabwe and Botswana will then provide the guarantees for that credit to hedge against risk. For its part, Botswana will provide surety via the Botswana Insurance Company which, coincidentally, is run by Zimbabwean Newton Jazire. One of the major points of the talks is that Zimbabwe must put up a counter guarantee via a reputable organisation. For years, Botswana has relied on its diamond industry. It has built very little manufacturing capacity of its own. It is now trying to do that, as Botswana’s Trade Minister Bogonelo Kenewendo explains. Botswana wants its companies to look outside their home, and Zimbabwe is one such market that could help them grow. “Sometimes a business needs a bigger market to jumpstart and Zimbabwe population is much bigger and has some raw materials we don’t have. We encourage the development of regional value chains that benefit from our combined strengths,” she says. In 2010, Zimbabwe and Botswana tried to set up a credit facility. It never got off the ground. Now they are making another attempt. 2. Botswana has offered to extend a 1bn Pula credit facility to Botswana businesses willing to invest in Zimbabwe. This facility is accompanied by the conclusion of the Bilateral Investment Protection and Promotion Agreement which will offer protection for such investments. Further, Zimbabwe will be required to take out a counter guarantee with reputable international lending institutions. These are conditions precedent to the facility being operationalized. Of importance to note is that the Government of Botswana is not taking money out of its coffers to give to the Zimbabwean Government. It is private financial institutions which will be extending credit to private sector businesses who will in turn invest in Zimbabwe with the two governments guaranteeing the loans. The intention for this arrangement is twofold vis to revive industry in Zimbabwe and to improve the export capacity of Botswana companies operating in the manufacturing and services space. This is in accordance with our vision of attaining an export-led economic growth. A similar intervention had been planned for South Sudan before it imploded. According to Kenewendo, this is an opportunity for Batswana to take advantage of. “Be on the lookout. In the meantime, Zimbabwe’s story is changing (and) you should be asking how you can be a part of that change,” she said. There are not many Botswana firms operating in Zimbabwe. In May last year, Botswana Diamonds signed an MoU with Vast Resources, listed in the UK, to jointly prospect for diamonds in Marange. Botswana Diamonds MD James Campbell described that deal as a “a first step” into Zimbabwe while the company chairman John Teeling said “Zimbabwe is a country with excellent diamond potential”. Choppies, a Botswana retailer, also has operations in Zimbabwe.